American Samoa High School Athletics Association (ASHSAA) boys hoops is back in action, resuming Monday with Leone versus Tafuna at the Samoana High School Gym in Utulei, while Faga'itua was scheduled to meet Marist/Fa'asao. However, Faga'itua was awarded the win when Marist failed to show up at the Tafuna High School Gym, which is the other venue allocated for the High School Boys Basketball League competitions. "All the high schools were given the ASHSAA year schedule, and they were also contacted a week in advance when the league would resume. So any team loss through failing to show up, is all on the heads of either the coaches or the school administration," explained one ASHSAA official. 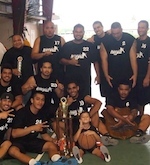 The Boys Basketball League came to a halt after the first week of competition when the DOE director Malaetele Lui Tuitele, ordered the games deferred just before the holidays. The order was due to SAT week, followed by the Christmas season, then another natural delay when cyclone Heta swooped by the first week of the new year. Despite the delay, the boys are pumped and back in business again. Leone and Tafuna are two of the three teams that made the playoff last year - the other, the Samoana Sharks. Leone and Tafuna were sitting at one and two, but Samoana upset both and wrestled away the championship. Tafuna was totally shutout by Leone in the whole quarter, and Tafuna even aggravated their poor performance by missing all shots even from the free-throw line. They turned the ball over as many times as their team roster - 15 times. Leone scored 10 points which was led by their forward #21 Kamilo with 4 points. Henry, Nick, and Fetu all contributed 2 points each. Leone 10 - Tafuna 0. Tafuna subbed their point-guard #41 Sunia, with #4 Daniel, who scored 3 points and a deuce from a 10-foot jumper, for his 8 points altogether in the quarter. Daniel single-handedly carried his team against the tough Leone defense. Leone had a new leader in the second, when guard #4 Nick was pushing through the Tafuna defense for a couple of easy lay-ups. He had 6 points, and #11 Henry and #10 Raymond both put in 2 points each, for the team total of 10 for the quarter. Leone scored another double-digit score, and was led by guard Nick, with good penetration and passing the ball around to open players constantly. Their team's good control really offset Tafuna, struggling with their defense since the start. Nick scored 6 more points including 2 from the line. Raymond made his 3 points from the line. Forward #11 Henry and #14 Livi chipped in 2 points each from 10-foot jumpers, for a total of 13 points. Tafuna #11 Sonny and #41 Sunia, both had two points, with #15 Wesley making a 3-pointer from above the arch which added to 7 points. Leone 33 - Tafuna 17. The game was already out of reach for Tafuna, so Leone coaches brought in other players for the rest of the quarter. Tafuna managed to bring in 6 total points for the last quarter. All from just two players, #5 Dave Umu, and Sunia once again, did Tafuna score. Leone forward #11 Henry scored another 4 points to lead his team, and finished the game with 8 points second only to #5 Nick who had 10 points.